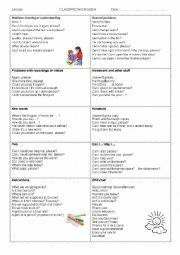 A handout for intermediate students to use English in the classroom situation. Help for asking for photocopies, excusing oneself, asking for vocabulary etc. I hope it will be useful as a reference for your students. I get mine to stick it inside the cover of their notebooks and refer to it whenever they need to or want to. 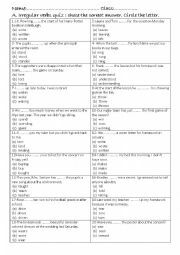 An information gap pair work activity to practise the past continuous and to pracise vocabulary.There is another series...B1 and B2 so that this activity can be done in pairs and the vocabulary learnt can be put to better use in groups of 4 in the game. 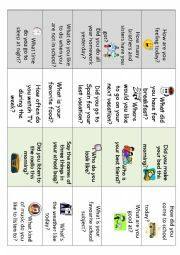 It was inspired by a great board game from mada 1 on eslprintables.Many thanks. 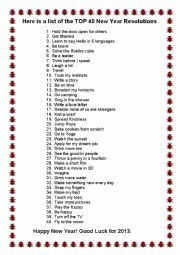 Here�s a list of 40 popular New Years Resolutions adapted forma a list of 200 on 3D Car Show�w website. I imagine there are lots of things we could do with these but my plan is to put them up on my classroom door to give my pupils some ideas and topics for discussion as they are waiting to start class. Happy New Year! 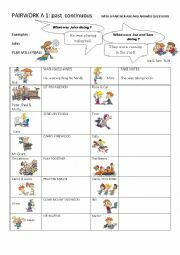 An information gap pair work activity and lesson plan about the past continuous and to pracise vocabulary.There is another series...A1and A so that this activity can be done in pairs and the vocabulary learnt can be put to better use in groups of 4 in the game. 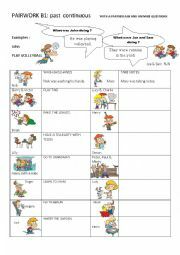 It was inspired by a great board game from mada 1 on eslprintables.Many thanks. A video about Christmas in Britain. My exercise includes vocabulary and frequency adverbs. 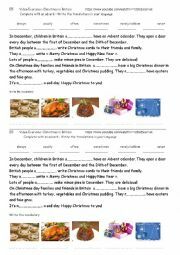 Video Exercise : Christmas in Britain https://www.youtube.com/watch?v=YzSGEeaYvJc Happy Christmas! A simple video with an authentic English girl talking about her back to school routine. There are loads of ways you could use this but I have chosen to do some revision as an easy way in to the new school year. https://www.youtube.com/watch?v=WKH3J2QpKe0 Full teacher notes included. Fully editable. 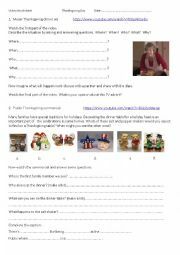 A worksheet featuring two Thanksgiving TV ads to give your students listening practise and a chance to talk about Thanksgiving traditions. Both commercials are based on traditional family dinners. The links to Youtube are given on the worksheet. A simple power point as an introduction to International Women�s Day. 8th March. Happy Women�s Day to all you ladies on ESLprintables! A simple illustrated powerpoint with silly school rules. Pupils should correct the sentences to make proper rules. I use this as a revision warm up after working on our classroom rules. A simple PP to talk about prices. It starts by introducing the signs for euros, dollars and pounds. The "How much" questions are about things you might give to a kid as a birthday present. "How much is the tennis racket? etc. I hope it will be useful to introduce or revise talking about money. and ideas included. This Power Point presentation is intended as an introduction to the passive voice. It deals with movies inspired by great writers. This introduction will also help them to appreciate the impact of Shakespeare�s writing in modern times.